Despite the heated political rhetoric of past weeks, the Liberals and Conservatives are still neck and neck in the polls. Poll analyst Éric Grenier breaks it down. 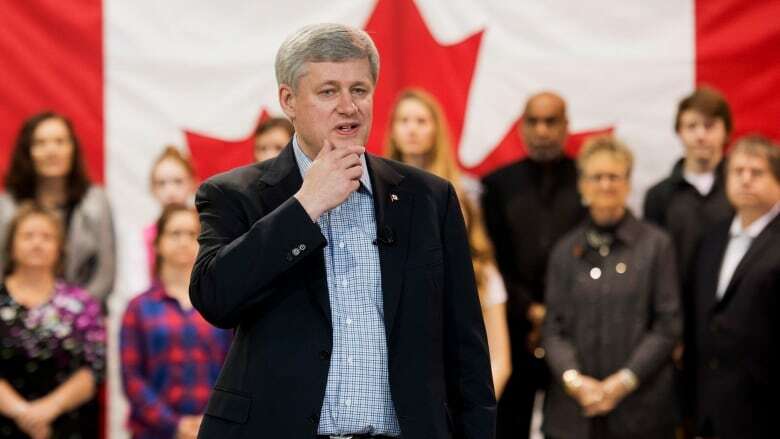 As the federal election draws nearer, the Liberals and Conservatives remain deadlocked in national voting intentions. The key to breaking the impasse lies, as usual, in Ontario. The two parties are in a tie in ThreeHundredEight.com's latest polling averages, with 33 per cent support apiece. Justin Trudeau's Liberals and Stephen Harper's Conservatives have been in a holding pattern for the last few months, with the Liberals averaging between 33 and 34 per cent support since mid-January and the Tories averaging between 32 and 34 per cent since the beginning of December. This is a much narrower gap than existed only five months ago, when the Liberals were averaging 36 per cent support, seven points up on the Conservatives. The New Democrats are currently in third with 21 per cent support, roughly where they have been since the beginning of the year. The Greens and Bloc Québécois trail by far, with seven and five per cent support respectively. The gender divide remains sharply apparent, with the Conservatives enjoying a five-point edge over the Liberals among men in polls conducted over the last month. Among women, the Liberals have a lead of six points. The NDP is also doing better among women than men. Weighted federal polling averages since October 2014. (ThreeHundredEight.com)With these levels of support, the Conservatives would likely come out ahead in the seat count with between 124 and 164 seats, falling short of the 170 needed to form a majority government. The Liberals would win between 105 and 142 seats, while the NDP would take between 51 and 80 seats. The Greens could win two and the Bloc could win between one and 10 seats, benefiting from a federalist-vote split in Quebec. British Columbia remains the tightest three-way race in the country, with just seven points separating first from third. The Conservatives have edged ahead in the province with 32 per cent support as the Liberals have slipped slightly to 30 per cent. Although this is a modest decrease, the party had been averaging between 31 and 34 per cent support since mid-November. The New Democrats have the support of an average of 25 per cent of British Columbians, their highest level since the end of January. Dreams of a significant breakthrough for the Greens in British Columbia last week appear to be dashed. The most recent survey from EKOS Research, after putting the Greens at 21 per cent the previous week, pegged Green support at a much more usual 13 per cent. The latest poll from Forum Research was even more pessimistic, putting the Greens at 6 per cent. But in the aggregate, the Greens have held steady at about 11 per cent support. The polls have been showing a lot less movement in the regions where the Conservatives and Liberals hold definitive leads. In Alberta and on the Prairies, the Conservatives remain well ahead with 51 and 40 per cent support, respectively. The Liberals trail in both with 24 and 30 per cent, while the NDP is in third with 16 and 20 per cent support. The widest lead in the country is held by the Liberals in Atlantic Canada, where they have 52 per cent support to 23 per cent for the Conservatives and 17 per cent for the NDP. The volatility that has been the trademark of Quebec polling of late has apparently died down a little, as the parties hold firm. The Liberals are averaging 29 per cent support in the province, followed by the NDP at 26 per cent, the Conservatives at 20 per cent, and the Bloc Québécois at 19 per cent. The polls have also been very steady in Ontario, where the hottest battle in the country is being waged. The Liberals are narrowly ahead with 37 per cent support, just one point up on the Conservatives. In fact, in every week but one since the Christmas break the gap between the two parties has never been wider than 1.2 points. 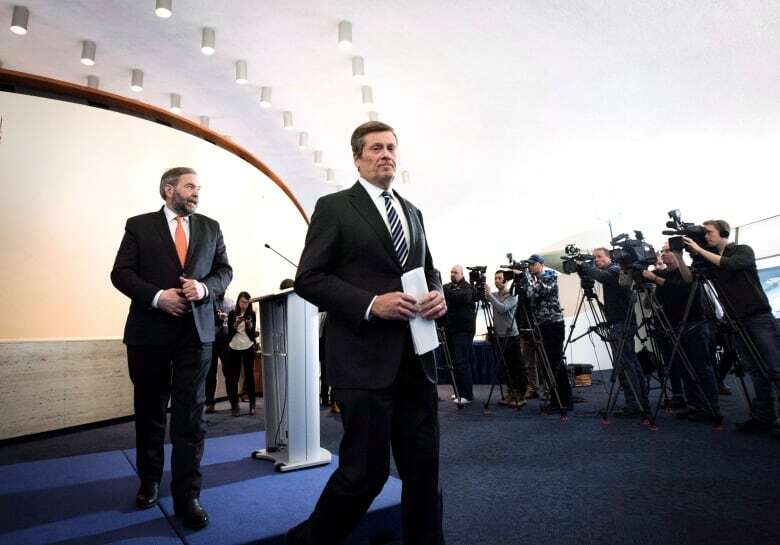 NDP Leader Tom Mulcair, left, met this week with Toronto Mayor John Tory. (Darren Calabrese/Canadian Press)The seat implications are enormous. The projection model gives the Conservatives between 47 and 65 seats and the Liberals between 43 and 59 seats in Ontario. Those ranges represent just under half of the swing seats the model currently identifies for the two parties anywhere in Canada. A shift of as little as three points in Ontario from the Tories to the Liberals, for instance, would be enough to put Trudeau's party in a position to come out ahead in the seat count nationwide. The New Democrats are bystanders in this electoral struggle, with 18 per cent support in the province. They are looking a little better recently, with polls ranging between 16 and 23 per cent over the last month, compared to a range of between 13 and 21 per cent in the month prior to that. The political debate over the last few weeks has been largely driven by Ontario. The NDP's need to improve its numbers in Toronto in order to have a shot at government explains Tom Mulcair's recent big speech in the provincial capital. The firestorm over the niqab has also been fuelled by the decisive importance of cultural communities in the Greater Toronto Area, where many of the swing seats in this year's election are located. For now, neither the Liberals nor the Conservatives have managed to pull ahead, and the New Democrats have a lot of ground to make up. Ontario should remain the focus of each party's electoral strategy straight through to October. ThreeHundredEight.com's vote and seat projection model aggregates all publicly released polls, weighing them by sample size, date, and the polling firm's accuracy record. Upper and lower ranges are based on how polls have performed in other recent elections. The seat projection model makes individual projections for all ridings in the country, based on regional shifts in support since the 2011 election and taking into account other factors such as incumbency. The projections are subject to the margins of error of the opinion polls included in the model, as well as the unpredictable nature of politics at the riding level. The polls included in the model vary in size, date, and method, and have not been individually verified by the CBC. You can read the full methodology here. Can federal Green Party stage a breakthrough in B.C. ?